From the makers of “Who Killed the Electric Car?”, it follows Tesla’s industry-catalyzing role in the resurgence and rise of electric vehicles. 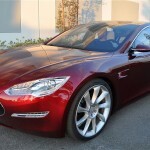 Tesla gave director Chris Paine insider access to capture unprecedented footage of Tesla’s history and growth leading up to the launch of Model S, the electric sedan poised to turn the tide against the internal combustion mainstream. We will be starting the film at 18:30 so please come around 18:00 for drinks and networking. Please bring a little cash to support the food and drink. This group is here to share lots of great information and ideas about how to change our world for the better. We examine and discuss social and environmental challenges and solutions that affect all the creatures who share this planet. The format is to have a guest film and/or speaker and interactive discussion mixed with food and drink. Just the sort of creative mind candy we need to drive positive action. This forum is open to anyone to contribute, share and (electrically) drive change.